NURSES AND MIDWIVES have voted today for a further two additional strike days as they escalate their industrial action. The Irish Nurses and Midwives Organisation (INMO) met this afternoon to discuss the potential for further strikes beyond the dates already set for industrial action – 5, 7, 12, 13 and 14 February. The new strikes will take place on 19 and 21 February. A national rally is also being planned for next Saturday 9 February. Its general secretary Phil Ní Sheaghdha said: “Nurses and midwives proudly stood up in defence of our patients and professions last Wednesday, but the government has responded with threats and intransigence. Our message is clear. We will not be going away – resolving this dispute requires direct engagement from the government, recognising the real recruitment and retention problems in Irish nursing and midwifery. Ní Sheaghdha added they would remain available for talks with the government if there were any “realistic proposals” on the table. 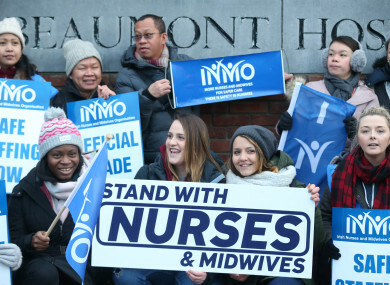 The INMO – which has over 40,000 members – announced strike action in January. In a ballot held in November, over 90% of members that were polled voted in favour of industrial action. Our Executive Council is meeting now to discuss further strike dates in addition to those already announced. Email “Nurses announce 2 further strike dates in addition to 5 already planned”. Feedback on “Nurses announce 2 further strike dates in addition to 5 already planned”.